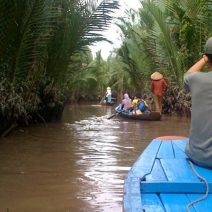 You can transfer to Ho Chi Minh City and between Ho Chi Minh City and other big cities like Hanoi, Danang by airway. Flights are always available at Tan Son Nhat Airport which is 7km from the city center. Most domestic flights from the City to provinces within Vietnam such as Camau, Buon Ma Thuot, Dalat, Nha Trang, Danang, Hue, Hanoi, Hai Phong, Con Dao, Phu Quoc, Pleiku, Quy Nhon, Rach Gia, Tuy Hoa and Vinh are controlled and operated by Vietnam Airlines. From the airport, you can transfer to the city center by taxi or motorbike taxi if you are traveling without much baggage. Train tickets are purchased at the ticket office of the station and also can be purchased from most travel agents. 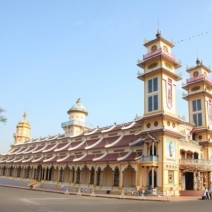 Mien Dong Bus Station, 292 Dinh Bo Linh Rd., Binh Thanh Dist., Tel: 898 4893. Mien Tay Bus Station, 395 Kinh Duong Vuong Rd., Binh Tan Dist., Tel: 877 6593. 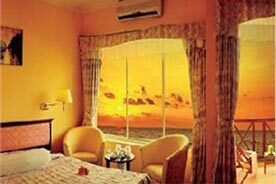 Cholon Bus Station, 84 Trang Tu Rd., Dist 5, Tel: 855 7719. This is the most convenient place to get buses to My Tho,Long An. 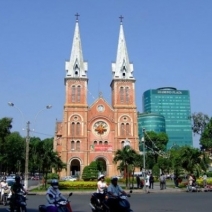 Besides, you can travel around Ho Chi Minh City through a city bus system. Taxi and motorbike taxi are also convenient ways of traveling. If you want to get around the city, motorbike taxi will be the quickest way and you can normally get one at almost every street corner.